Investing in a bathroom remodel for your home in the Richardson, Texas, area can be a fantastic decision, as doing so can increase the beauty, functionality, and value of your home. To make certain you put your bathroom renovation in the hands of trusted professionals, turn to the skilled experts at Star Home Remodeling. Since our founding in 2007, we have been committed to providing our customers with five-star customer service while completing stunning renovations. In fact, our gorgeous work has earned us a number of accolades throughout our years in business, including multiple Best of Houzz awards. 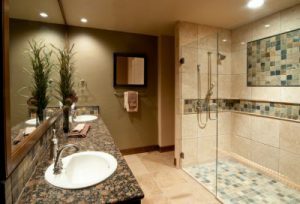 When you turn to us for your bathroom remodel, you can rest easy knowing we can handle all aspects of your project. As a full-service firm, we act as a convenient and reliable source for all of your home renovation needs. From creating a stunning bathroom design that directly reflects your style and meets your needs to installing premium products we’ve curated specially for you, we can do it all. Some of the products we can incorporate into your new bathroom include a modern or luxurious soaking tub, unique lighting, large mirrors, eye-catching countertops, easy-to-maintain flooring, and virtually any other feature you’d like to include in the space. To get one step closer to enjoying the bathroom of your dreams, contact Star Home Remodeling today. One of our friendly and knowledgeable associates will be delighted to answer any questions you have and speak with you in depth about the bathroom remodel we can complete at your Richardson, TX, home.